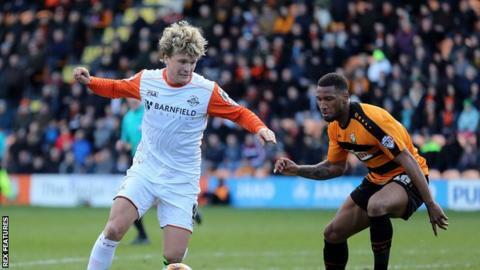 Luton Town midfielder Cameron McGeehan praised Barnet's resilience after Monday's 2-1 defeat in League Two. The Bees snatched the win with an injury-time penalty from John Akinde, who secured the points with his 16th goal of the season. "We were against the wind, Barnet put it in the box and they play to their strengths," 20-year-old McGeehan told BBC Three Counties Radio. "We've been sloppy at the back yet again and it's cost us." The former Norwich City youth player, whose goal levelled the scores before Akinde's late winner, said they were fully aware of Barnet's likely approach before kick-off. "It's not the prettiest thing to watch but they get results, and it's how their manager likes to play. We knew what we were up against coming into the game but we've got to be better," he continued. "This pitch, I don't know if it's tight and harder to play on, but they're tough to play against and we didn't play our normal game. Credit to them, they do their job well." Luton boss Nathan Jones has only been in charge of the Hatters since January, but McGeehan remains optimistic his preferred style will pay off. "As the games go on with Nathan Jones we can start to play in those games and come here and dominate rather than getting sucked into how they play," he added.